"Wild Card" ...screenplay by William Goldman? Friends In Your Head | Forums → Movie Stuff → "Wild Card" ...screenplay by William Goldman? Topic: "Wild Card" ...screenplay by William Goldman? 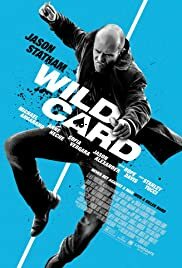 Wild Card is a 2015 American action thriller film directed by Simon West, and starring Jason Statham, Michael Angarano, Dominik Garcia-Lorido, Milo Ventimiglia, Hope Davis, and Stanley Tucci. The film is based on the 1985 novel Heat by William Goldman, and is a remake of the 1986 adaptation that starred Burt Reynolds. The film was released in the United States on January 30, 2015 in a limited release and through video on demand. 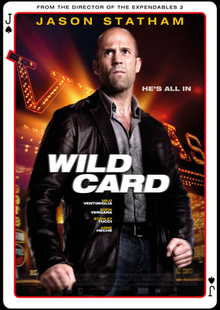 Wild Card was a "box office bomb", making only $6.7 million internationally against a $30 million budget. I was originally just browsing in search of a film to help me develop my hooligan British accent, and would've passed on this if not for the spiritual 5th FIYH Goldman's name on it. This is apparently the second failed attempt at bringing this to the screen, both times as vanity projects produced by the lead actor. Burt Reynolds was the first to give it a go in "Heat"
Neither this nor the 1986 version focused (until the end) on the weak rich guy wanting to learn to be tough which was probably the nugget that Goldman was half-heartedly polishing in the novel. The big sequence of Nick Wild's improbable run of luck at Blackjack, is followed predictably followed by the self-destructive total loss on the last hand. It's been done better in other films. The fisticuffs are on-par, except so many frames are brutally excised from the film during the moments of contact that there must've been blood all over the editing suite. Disappointingly, Tucci's blood pressure never rises above, "golfing for 9 holes," in any of his 3 short scenes. On the upside, I've ceased to pronounce my 'atches, so mission accomplished.